Become a political pro with a few handy web apps that will help you sort out which Presidential candidate is winning on Election Day. The first candidate to win 270 Electoral College votes will be crowned the most powerful man in the world, but only a few swing states actually matter. Because we know from recent evidence that difficult math problems can cause physical pain, we gathered a few online tools to make sense of the math throughout Election Day. If geography is more your style, or if you’ll be following the election along with TV broadcasts, which will most likely be using maps, the CNN electoral map is a handy tool. 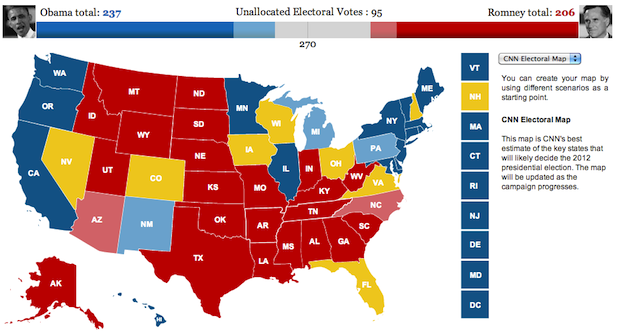 The map allows user to pick their own scenarios, and conveniently pre-color codes the states as leaning toward Obama or Romney.